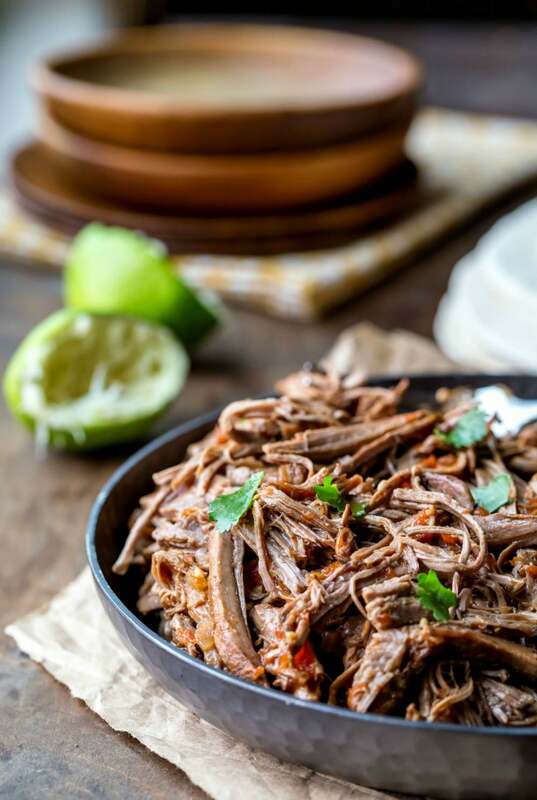 Take Taco Tuesdays up a notch with this tender Mexican Shredded Beef recipe that cooks in the crock pot! The flavorful sauce and juicy meat make a great filling for tacos, burritos, quesadillas, and more! This Mexican shredded beef is an easy recipe that can be used as the base for a number of other recipes. This tender beef works well in tacos, burritos, enchiladas, quesadillas, and more. It takes just a little more time than a dump-and-go slow cooker recipe, but it can still be prepped and in the slow cooker in less than 20 minutes. Can I use a different cut of meat? You can. I like to use a shoulder roast because it works well for slow cooking. It takes a long time to break down, but once it cooks, the meat is tender and leaner than with a lot of other cuts. 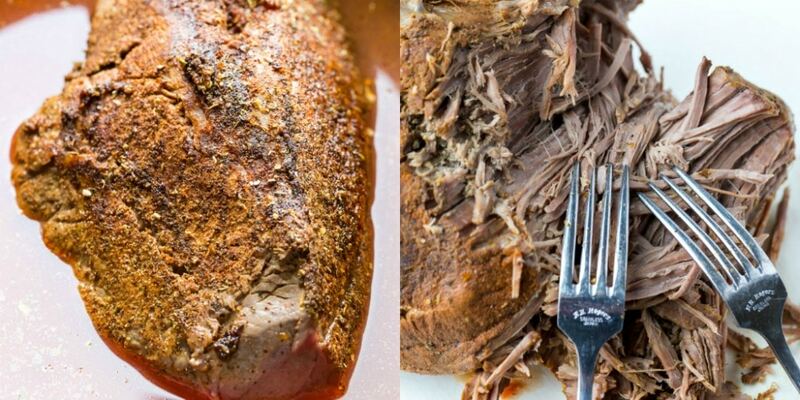 If you can’t find a shoulder roast (or don’t want to use one), you can use another cut, like a chuck roast, that is well-suited for slow cooking. Can you skip browning the meat? 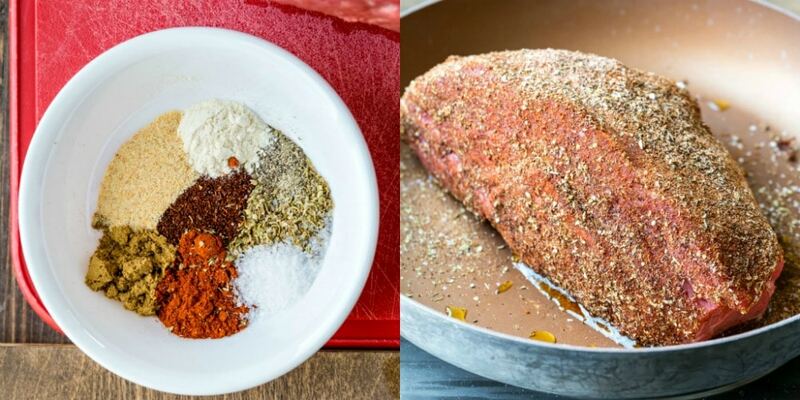 If you’re in a hurry and don’t have time to brown the meat, you can skip this step. Browning the meat does give the meat more flavor, but it isn’t absolutely crucial. More slow cooker beef recipes! 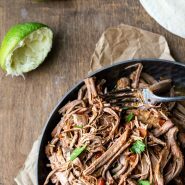 If you’ve tried this Mexican Shredded Beef recipe, don’t forget to rate the recipe and leave me a comment below. I love to hear from people who’ve made my recipes! You can SUBSCRIBE to receive my latest recipe newsletters or FOLLOW ME on FACEBOOK, INSTAGRAM and PINTEREST for even more delicious food. Easy Mexican shredded beef that makes a tasty filling for tacos, burritos, and more! Stir together spice rub ingredients in a small bowl. Rub spice mixture onto the surface of the roast. Add the beef, and cook until browned on all sides. Place beef in slow cooker insert. Add garlic and onion to now-empty skillet, and cook 3-4 minutes, stirring regularly, until onions have just softened. Pour onions and garlic around roast. Pour in enough water so that the beef is about 2/3 covered with liquid. Cover, and cook on LOW for 8-10 hours. Beef will be done cooking when it is fork tender. Remove the beef, and shred with 2 forks. Turn slow cooker to HIGH and let the sauce cook with the lid OFF for about 20 minutes to thicken the sauce. Serve beef topped with sauce, or return beef to slow cooker and toss beef in sauce. *I prefer ancho chile powder because of it's milder, smokier flavor. **Chuck roast or a similar cut of meat will also work in this recipe. Delicious! Easy and very tasty. Will make again. Thanks!